Although the trim carpenters have not finished applying all the exterior trim, this building is worth looking at in its unfinished state. Beth El is a spectacular example of Eastern European wood and gothic masonry motifs modified for frontier American construction. The arched ceiling and the balconey, despite its Reform intentions, suggest Polish Orthodox origins. The rose window with Magen David and the Ten Commandments below were manufactured in the studio of Louis Comfort Tiffany. 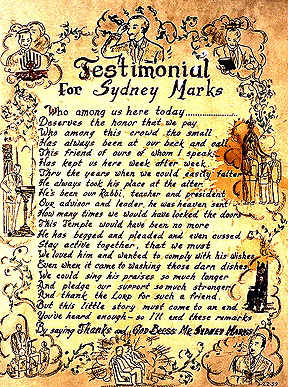 Uncovered in a pile of junk on the balconey, left behind when the congregation vacated, but not to be forgotten is a tribute to a member who held the place together--Mr. Sydney Marks. These are the real treasures of any community, and there is little of substance accomplished without them.